Is a tomato a fruit or a vegetable? Your answer says more about you than it does about tomatoes. We have already seen how Wittgenstein’s concept of a language game can provide us with a more mature approach to language by seeing that words are symbols used in games of communication, and words are essentially moves in these language games. But to get to the bottom of the problems of language, we must also see how differences in our individual use of language – our idiolects – can completely change the game we are playing. This post presumes a basic understanding of Wittgenstein’s concept of a language game. In the absence of this, please read the earlier post, Language Games. It will greatly reduce the risk of potential misunderstandings. Even if you have read this post before, it might not hurt to re-familiarise yourself. The notion of an idiolect refers to the specific elements of language as used by any individual, including but not restricted to patterns of word selection, grammar, idioms, pronunciations and the semantic content of words. It should be understood, therefore, that if we accept the notion of an idiolect, then every individual has their own individual idiolect. Many philosophical problems originate in the way in which one treats idiolects. For instance, the most common philosophical error (the fallacious ‘name theory’ Wittgenstein argued against, and what I sometimes call ‘Plato’s error’) is to believe that words are labels which correspond to real word entities – that is, to believe that one’s idiolect accurately refers to specific concepts irrespective of context and the content of the idiolects of those people you are talking to. For example, it would be a philosophical error to presume that when one says “tree”, one refers to a class of entities: ‘trees’. But of course, what will be understood by a second party when you say “tree” will vary according to that person’s idiolect. If you are both sat by a tree, it is quite likely your language game move “tree” will be interpreted in reference to the sensory impressions you both have of this tree. But in other contexts, other meanings will apply. If your Irish friend just asked you how many beers you wanted, the answer “tree” will likely be taken as a number! Please note than an idiolect is not the same as the notion of a private language, which Wittgenstein argued against. His view was that there is no such thing as a private language since language is, in effect, a social construct – meaning is something that occurs between people. This does not preclude idiolects, however, since the idiolect can be understood as the (abstract) sum of a person’s knowledge and habits in the language games that they play. When two people enter into argument with each other, the most common cause of the disagreement appears to be differences at an idiolectual level – that is to say, most arguments result from nothing more than attempts to make moves in a language game the meaning of which transpires to be radically different than expected. Because the meaning of the words you use with respect to someone you are talking to depends upon their idiolect (among other things), attempts to enforce one’s own conception of what the words mean is a disaster which can only result in the confusion and anger of cognitive dissonance. A thought experiment may serve to put this into context. Suppose there exists a person in whose idiolect the word ‘fruit’ means apple, orange or tomato (only), and this person has a friend for whom the word ‘fruit’ means apple, orange or a homosexual (only). They are both in a room, and there is a tomato and a telephone upon the table. What happens when the first person asks their friend to “pass the fruit”? She can be justifiably confused! There are no apples or oranges upon the table, so perhaps he means that either the tomato or the telephone is a homosexual? An argument will ensue if the two do not take the time to ensure they are using their words consistently. Many people routinely make the mistake of thinking that all words can be consistently applied as logical categories (an issue often intensified by strong faith in dictionaries). This may work sometimes and for some words, such as numbers, but it is a minefield of potential misunderstandings. Wittgenstein noted that the way most words are used is quite different: they are more like family resemblances; a generalised connective principle applies. In other words, a person’s idiolect connects such a word with a group of general properties that indicate to what degree individual instances belong to the class the word represents, in much the same way that a group of biological relatives share certain common characteristics. (Since this kind of ‘fuzzy logic’ is already closely associated with the behaviour of neural networks, we should perhaps not be wholly surprised). Consider this: horticulturally, a tomato may be defined as a ‘fruit’ but to anyone who is not a horticulturist the issue of whether a tomato is a fruit depends upon how closely they feel tomatoes fit the family resemblance category of ‘fruit’. A large proportion of people feel tomatoes better fit the family resemblance category of ‘vegetable’. As a result, anyone whose idiolect favours the horticultural definitions will find themselves potentially at risk of argument with other people when it comes to discussion of the humble tomato. The more obviously the word fits this idea of family resemblance, the worse the potential for misunderstanding and argument. For instance, all genre terms are family resemblance terms practically by definition. During my early philosophical investigations, I was surprised by the differences in people’s idiolects with respect to the term ‘soap opera’, as it is used in the UK. Although to most people this term seems to be clearly defined, it transpires that different people note different commonalities between those things which are referred to as ‘a soap opera’. In one case, a friend of mine denied that a certain show was a soap opera because of the unique definition he used in his own idiolect – and since he was emotionally attached to the show in question and he viewed ‘soap opera’ as having negative connotations with regards to quality, his protestations were quite agitated! One can see the same problem whenever people argue about the meaning of genre terms, especially for videogames as those people that talk about videogame genres tend somewhat towards both bellicosity and premature certainty. Another classic example of arguments rooted in what might be called the family resemblance problem occurs whenever the word ‘religion’ is used. Once again, the diversity of systems that are referred to as ‘religions’ is very large, hence the idiolectual variation accompanying this term is correspondingly large. Especially problematic is the fact that people in English speaking countries tend to have been exposed primarily to the major monotheistic religions, but have little personal experience of Buddhism, Hinduism, Confucianism, Vodou, animistic religions and so forth. The result is often family resemblance categories that reflect monotheism rather better than world religion in general. (This does not make such a person ‘wrong’, but it is a potential cause of argument with someone with a different view). And of course, because people have strong emotional attachments to their positions on religion, cognitive dissonance is often the result of a clash of idiolects in the context of religion, especially between people with different stances on the topic of theism. One of the consequences of the issue of family resemblance in language is that there is a certain sense in which a person’s reality is determined by their idiolect. This is closely related to the Sapir-Whorf hypothesis, although it should be noted that the more we examine the proposition, the clearer it becomes that it is beliefs which determine personal reality (or emic reality), as the meanings of words are a special case of beliefs. This does not preclude there being an ‘external reality’ (or etic reality), although it is a simple philosophical exercise to demonstrate that there is an unavoidable step of belief involved in accepting the existence of such a concept, albeit a step many people find trivial. Let us close with another thought experiment. Suppose there is a person from a culture that considers all soft ovoid foodstuffs to be called ‘fruit’, has no other word for any of these objects (an apple and an orange are simply green and orange fruit respectively), and has no tradition of constructing linguistic taxonomies to describe objects. What happens when they encounter a tomato for the first time? If they had no word adequate to the task of describing the tomato, they might be inclined to coin a new word. But since their word ‘fruit’ fits the tomato, the tomato will be interpreted as a ‘red fruit’. No degree of argumentation is likely to convince them to call the red fruit ‘a tomato’, because without a tradition of taxonomies, words are not grouped under classes designated by other words. It is clearly a fruit – how can it be anything else? The more you attempt to exert the word ‘tomato’, the more likely they are to conclude that ‘tomato’ is simply your word for fruit! The opening image is ‘L’art de vivre’ (‘The Art of Living’) by René Magritte, whose painting ‘La trahison des images’ (‘The Betrayal of Images’) inspired the title of this piece. 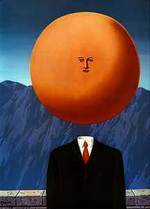 Good post and even better choice of Magritte as the perfect visual complement to the subject of discussion. Thanks for coming back to Wittgenstein. I still have yet to read him personally, but through your discussion of his brilliant work with language I've come to appreciate the considerable work he did. I've always enjoyed conversations with people that turn into comparing ideolects and strong, specific associations with words. "people that talk about videogame genres tend somewhat towards both bellicosity and premature certainty." Nobby: "It's a tomato. Bit squished." Detritus: "Oograh." (Points at tree) "That oograh too." Great post, this would explain a lot of the debate about storytelling in games. It also prompts me to write my RT post. Not having read any Wittgenstein I've been pondering whether it is ever possible to confirm that two people are playing the same language game, or if this can only been shown by a clear breach of understanding. You hint in that post that he does not precise the nature of this type of incongruence, which in a sense is even more devastating for what are when then left with to determine our (mis-)alignment? I'm not sure I agree with you that cognitive dissonance is likely to occur when several people with varied idiolects interact. This would require the individual to attempt to internalize the two conflicting world views? - which is not necessarily the case in a debate. I'd like to add another slant to this too- a discussion of grounding theory - i.e. the concept that (and how!) people try to establish common ground. Of interest might be the work of Keysar and others. This is however limited in scope as this particular area is very much limited to object reference (referring expressions in computational/psycho linguistics). I'm vaguely aware of a body of work on humor and idiolect, but have not read any work pertaining to idiolect and group membership (back to your reference on religion, and I am sure there are plenty other noteworthy societal divisions), though I'd imagine this must have been discussed plentifully. Please do let me know if you can think of any references. Again many thanks for the brilliant posts! nomad: thanks for the comment and the kind words! Is it possible to confirm that two people are playing the same language game? I would tend to say yes, albeit provisionally: one can always confirm the definitions of terms before discussion. But this process can be infinitely more lengthy than the discussions in question, so the question perhaps is when it is worth committing to this kind of ground work. Regarding cognitive dissonance in a debate, I take your point. The idea I was trying to raise is that differences in ideolect are like "unexploded bombs" of cognitive dissonance that can be set off by the use of the "wrong" word. Some terms are more inflammatory than others of course, but it's difficult to know in advance where such "bombs" might lie. Thanks for the reference to Keysar; I've not looked at this before. It strikes me that this kind of agreement of terms is very much like the process Wittgenstein describes in the (hypothetical) establishment of a new language game. There is a sense, therefore, in which we might claim that while we become "language game literate" in general terms, we must establish the "house rules" in specific contexts. Certainly, people who work together benefit enormously from a common lexicon. "one can always confirm the definitions of terms before discussion"
... subject to grounding... which is fine if you're near each other and can point at things, but far, far more entertaining on (say) a blog. Whilst reading this post I couldn't help be reminded of memes which were mentioned in Richard Dawkins' book 'The selfish gene'. Social memes could well be a reason certain mis-understandings could arise due to differences in language. Excellent post; very thought provoking. Ha, you can see my criticisms of the notion of "memes" here, although it's not my best writing. In brief: there's no sign that culture and behaviour breaks down into atomic elements, so 'meme' is at best a metaphor. I have an issue that you may be able to help me with, and I feel that this thread is a suitable enough place to ask. When I think, unless I'm composing a sentence or paragraph of some sort, I don't think in a language (at least a spoken one.) I've tried to talk to a few people about this, but ironically, or perhaps not, words seem to fail me in most instances. This line of thought has led me to think of language as a more human construct than before. To put it simply, I think the human brain has it's own vastly more complex language, and that when speaking to others humans translate their ideas into a spoken language. This could possibly help to explain the prevalence of misunderstandings in speech. C..: this is an interesting topic, one that I have explored in discussions with people who speak more than one language. I find that the majority of people can identify a "language of thought" and that it corresponds to their native language. When people talk in another language, there does not seem to be a 'translation step' so much as the thoughts are also transposed, so some extent, into the destination language. Regarding the brain having its own language, this is in itself a major topic of research and commentary. Noam Chomsky famously believed in a grammatical structures being built into the brain, and although he has had some support from researchers the jury is still out. From my own perspective, it seems to me that much of language is processed and recorded as associations; people with multiple languages acquire multiple associations for related concepts - it seems once you can do this once or twice, there is almost no upper limit to how many language associations you can stack up. (My great great grandfather on my mother's side, I'm told, spoke twelve languages and was the interpreter to the Pope, for instance). Reasoning, however, can happen on a conceptual level independent of thought. For instance, artists for the most part seem to work entirely in this conceptual space, separate from vocabulary. In this sense, I agree with you that the "brain has its own language", and the conversion into words may be a separate step. Rather than this being the brain's language from the point of view of a common human grammar my suspicion is that each brain has it's own conceptual "language" that relates to its internal synaptic wiring i.e. how concepts and ideas are interconnected within the brain. I'm a long way from anything concrete in this regard.